KUALA LUMPUR (May 13): Prime Minister Datuk Seri Najib Razak, who is suing opposition lawmaker Tony Pua, has accused the DAP MP of incessantly attacking him over strategic investment fund 1Malaysia Development Bhd (1MDB) to gain political mileage for the opposition coalition, Pakatan Rakyat (PR), court documents showed. "It is an attack on the plaintiff's credibility, dignity or trustworthiness as an individual," Najib said in documents filed in the defamation suit against Pua sighted by The Malaysian Insider. "It is to gain support for his attempt to discredit the plaintiff," said the prime minister, whose solicitors last week filed a statement in reply to Pua's defence. Najib filed a suit against the Petaling Jaya Utara MP on March 7, in what is the first case of a Malaysian prime minister suing an MP for defamation. Najib said Pua was full of malice, adding that the opposition MP's dominant motive was to gain political mileage for the opposition coalition. If Najib is successful in proving that Pua's alleged defamatory statement was done with bad intention, then all defences – justification, fair comment and qualified privilege pleaded by the DAP lawmaker – would not be sustainable. The prime minister also named Mediarakyat portal owner, Chan Chee Keong, as second defendant. Both Chan and Pua are being sued over comments against 1MDB in a video recording of a speech by the opposition MP. 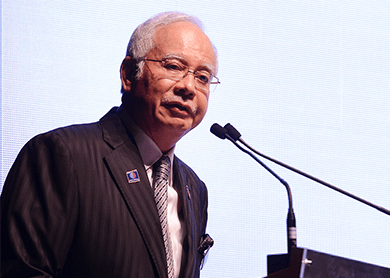 In the suit, Najib said the speech, which was uploaded by Chan or his agents on to Mediarakyat's YouTube and Facebook accounts, was later republished by Pua on his Facebook page. Najib is seeking an apology, a retraction of the statement and damages. In November, Najib had sent a letter of demand to Pua demanding an apology within 14 days in two national newspapers, or face legal action over the video of the speech entitled “Tony Pua: Najib is creating the biggest scandal ever in the history of Malaysia”. According to a transcript, among the things Pua had said was: “Let me tell you, this is the problem with Barisan Nasional. No one dares to stand up to the prime minister and Najib now is like a king. A king that is creating the biggest scandal ever in the history of Malaysia. Huge! No one dares to say a thing, nothing, not even a pin drop from any MCA or Gerakan leader or even Umno leaders". Najib in the court documents said he was very disturbed by the remark that he had robbed the people – a highly scandalous allegation that was harsh and unreasonable. Najib said the allegation was made and directed at him in his personal capacity, adding that the accusation he stole the people's money was a slur on his personal reputation. He said Pua did not obtain any comment from him and the video was one-sided. Najib also said that 1MDB's advisory board, of which he is the chairman, had no role in its daily operations as it was run by its board of directors and management. The prime minister said he would also prove that Pua's speeches and utterances were solely to advance his personal political interest and that of the DAP, were not made in good faith and were not in the interest of genuine public debate. In his defence, Pua said he had a duty as the people's representative to raise issues of public interest. "It is my legal, social and moral duty to raise issues of public interest," said Pua, citing qualified privilege as one of his grounds of defence in response to Najib's suit. The DAP national publicity chief also said the public had the right to receive information on issues that affected them. "As an MP, I made a fair comment on a matter of public interest based on verified information and facts," he said. Pua is also relying on the defence of justification and said the information revealed to the public on 1MDB was true. In his 23-page document of defence, Pua also questioned Najib's standing to file the suit since he was Pekan MP, the prime minister and also finance minister. Mediarakyat portal owner Chan has also filed his defence on March 31. However, Pua last Friday filed an application to strike out Najib's suit on grounds that the prime minister lacked capacity to bring the action because he was a public figure who has to accept criticism.